Previous edition: London: Family Learning, 1998. Be the next Albert Einstein with these cool science experiments. Discover how to bend light, construct a circuit, see sound, build a buzzer, make a rainbow, and even make an underwater volcano! Each science project is explained simply and clearly, with specially commissioned full-colour photography that shows how each project should look, making the experiments even easier to follow. The chapters are arranged thematically and include - Air and Gases, Water and Liquids, Hot and Cold, Light, Colour, Growth, Senses, Sound and Music, Magnets, Electricity, and Motion and Machines. 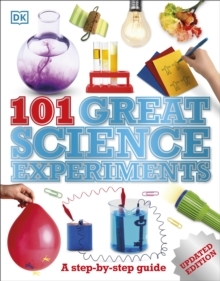 Great Science Experiments is a children's science book that packs fun into experiments while explaining core scientific principles. A child can perform most of the experiments alone, but friends and family can join in and learn about science, too.